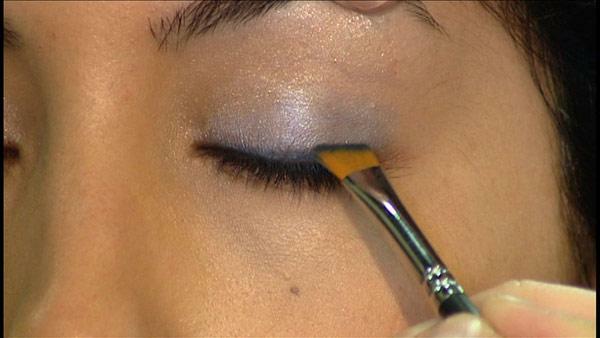 Makeup artist Ginny Lee with Satori Salon has a few tips and trick to making anybody's eyes stand out. If your eyes look red or tired, avoid eye makeup with red or purple undertones. If you have dark circles under your eyes, don't wear eyeliner on the bottom. Just wear waterproof mascara that won't smudge on lower lashes. If you want to brighten your eyes, put a light colored shimmer below your brow bone and near the inner corner of your eye. Do not match your eye makeup to your eye color. Instead, choose contrasting colors, no matter what skin tone you have. If you have warm colored eyes (shades of brown, some hazels), use cool colored eye makeup like greens or blues. If you have cool colored eyes (green, blue, some hazels), choose warm colored eye makeup like purple or gold.